The headline is shared mostly in jest, but this topic is one worthy of serious attention. The question at hand is whether or not the general advice shared in popular blogs and books when designed to be snappy, shareable, and consumable, help or hinder the ability to learn critical and important lessons in social media. I recently read a post by Alan Maites that used an article that I wrote for AdAge as the nexus for an industry-wide quest to seek answers for specific marketing challenges and ambitions. Chris Syme also continued the discussion. There’s nothing here that addresses the special circumstances that can make social media difficult for marketers to use. Obviously, a guide on style and persona is not intended to address special circumstances on how to make social media easier for marketers. However, herein lies the essence of the frustration many share, including me – the ongoing need to discover useful direction, answers, how to’s, and guidance. Advice is a commodity, but usable, not practical, instruction is scarce. While his counsel to help marketers find solace is to “Google it,” I would like to take the opportunity to forward the discussion. My advice? Reduce the weight you place on the social media guidance and examples that are universal, as they won’t apply to the specific circumstances or context of your challenges, opportunities, and market dynamics. Use them solely for inspiration, but not as templates for your endeavors. We can’t assume that the lessons and successes we study are motivated by planning, calculation, and purpose. Many of those experimenting online today do so with more resolve than strategy. Creating a profile on Twitter, blogging, and introducing brand pages on Facebook are rudimentary. Mapping social media capabilities and corresponding objectives that contribute to the common goals of any organization require vision, creativity, and business acumen that are vastly absent from Google’s search results. The only resolution to help you begin your path to learning lies in the questions you ask and answer yourself. The sentiment shared by Alan and others is not at all wrong. It’s exactly right. 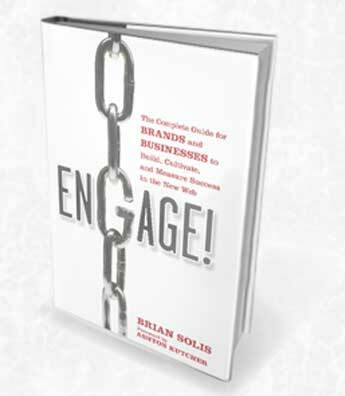 When I started to write Engage!, I too, couldn’t find meaningful advice or instruction that I felt would apply to a majority of the organizations that face distinct challenges. And at 300 pages, it makes no apologies for the amount of information within, as there really are no shortcuts. I spend every day experimenting with new media in marketing, advertising, communications, media, business, service, and I can assure you, that there is no “top 10 guide to do X” that will apply across the board. I answer my own questions in every case I work on and I share much of “how to get those answers” in everything I write. Any program tied to templates will perform as such. For example, I recently met with a handful of small businesses as part of a Citibank initiative to help companies get started in social media. It was very different than anything I write or read, and in each case, the steps they would take the next day shared very little in terms of execution. When you really peel back the layers of specific business objectives and how to attain them against unique market conditions, the questions and answers that surface bear little resemblance from business to business. I’m a champion of self-empowerment and the only replicable process that I’ve discovered that consistently works in new media, is the necessity to gather, interpret and implement insight into programming that matches the dynamics and challenges of the matter at hand – one company or one objective at a time. It is the only way to evolve from where we are today to the level of expertise we so often seek from others. The truth is that experts, whether it’s social media or any field for that matter, are inspired by possibilities, but proven through experience and the ongoing quest to transform theory into practice. The more seasoned experts will also have figured out how to establish business metrics and in turn, design campaigns that map to objectives. It’s this process of asking and answering questions that forms the framework for how and what to measure in order to capture everything necessary for KPIs, ROI, and also action that has a pre-defined impact on any effort. But you can’t measure what you don’t know to track. You can’t start if you don’t know what questions to ask. I believe that programs inspired by insight, data, and business-caliber goals (before you start experimenting) set the foundation for a program that might share some attributes with many of the “how to’s” that are out there, but are unique in their content, context, execution, support, and measurement – and that’s the point. Much of the information online is helpful for inspiring creativity and direction. But, it’s up to each one of us to get the answers through the hard work necessary to see how any of this applies to our unique challenges and opportunities that face us today and tomorrow. We have to become the very experts in our space that we once sought to answer our own questions. Our works should focus on empowerment, placing the responsibility of leadership and direction directly on us. The real opportunity lies in our ability to teach individuals to become self-sufficient. This entry was posted on Monday, June 7th, 2010 at 5:23 am	and is filed under Uncategorized. You can follow any responses to this entry through the RSS 2.0 feed. You can leave a response, or trackback from your own site.